A man tried to bribe a Royal Marine who he knocked out with one punch in a pub to drop the case, a court heard. Dean Mallinson, 26, launched the unprovoked attack in December last year on Jonathan Whittaker in House of Vodka, Botchergate, Carlisle. Carlisle Crown Court heard he offered Mr Whittaker £2,000 to keep quiet. Mallinson, of Kirklinton, Carlisle, admitted causing grievous bodily harm and perverting the course of justice. He was jailed for two years. The hearing was told that at the time of the attack, the 24-year-old victim had just passed out of the Marines after completing initial training and was awaiting details of his posting. 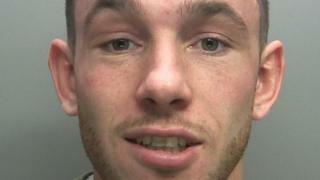 He suffered a broken ankle in the attack and his "dream career was derailed", the court heard. It was also told Mr Whittaker had been given two years by the Royal Marines to get himself "combat-fit" but was not sure whether he would be well enough.